For Custom Quote, Please fill in the form at below. We would love for you to visit us. We are at central of the golden triangle of kuala lumpur. We are located in front of Novotel Hotel . 10 minutes walk from Bukit Bintang, Lot 10 , Pavilion and 20 minutes walk from Berjaya Times Square. There is a Monorail which you could take and exit at Raja Chulan Terminal. 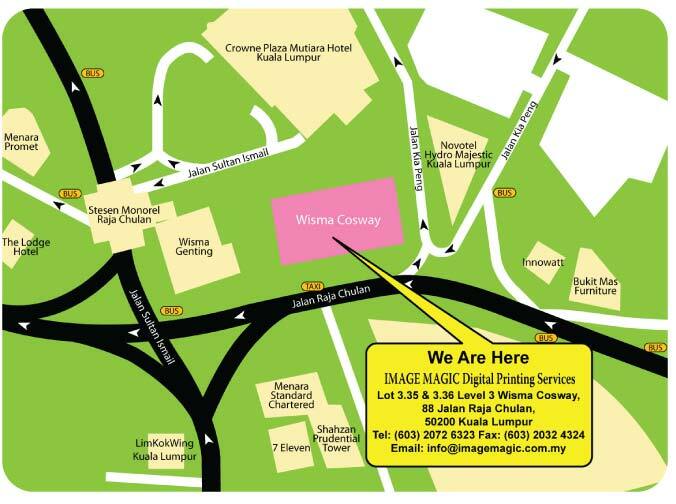 Walk along Wisma Genting and get to the next building which is Wisma Cosway, walk to the entrance and take elevator to Level 3, turn right and we are there. Please get in touch and let us help you with whatever questions you may have. Our Customer Service team has all the answers on how to use the website and any issues relating to your order. We endeavour to respond to all messages within 24hrs.